11 prizes to be won! 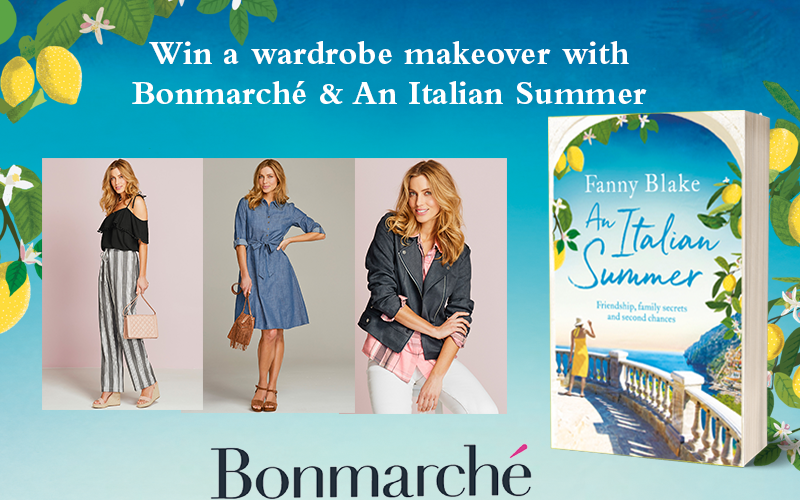 To celebrate the publication of Fanny Blake’s An Italian Summer we’ve partnered with the UK's largest value retailer for ladies clothes, Bonmarché to give you the chance to refresh your wardrobe! Whether you’re looking for holiday essentials or everyday pieces, Bonmarché has an array of summer styles in sizes 10-24. Enter to win a copy of An Italian Summer and a voucher worth £100 to treat yourself in-store or online. There are 10 copies of An Italian Summer for runners up. Sandy is in her fifties, and at a crossroads in her life: she's a teacher and respected by her pupils, but she feels she is being sidelined in favour of younger colleagues. So when her mother dies, leaving her a sealed envelope addressed to an unknown woman living in Naples, Sandy decides to head to Italy to resolve the mystery by delivering the letter herself. She books herself on to a small sightseeing trip from Rome to Naples and the Amalfi Coast, hoping to meet some like-minded people along the way. Who is the mysterious woman she is searching for? And will Sandy find friendship, or even love, along the way...?